As I type this, Basil is cleaning out the garage. Again. And as usual, in addition to putting all the things back that should have just been returned to their proper homes along the way, he’s stopped to wander through some boxes of stuff he’s been meaning to go through. These boxes are barely held together with sheets of dried-out tape, their flaps folded over so many times the creases are satiny soft. 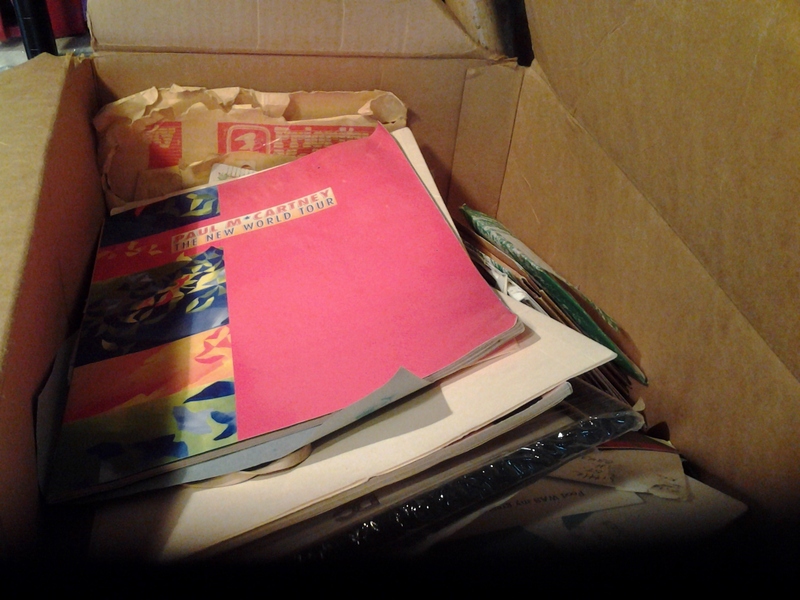 The program for Paul McCartney concert from 19 years ago hides a treasure-trove of photos, cards, letters, and heaven only knows what in this box of stuff Basil keeps moving around the garage. They contain birthday cards, old receipts, pictures fading with time. Schoolwork, (A B- on a high school civics report he just dropped everything to show me), concert programs, love letters (at least I think so, judging by how quickly he folded them back up and announced that Catherine should never see them). Like his father before him, Basil cannot part with anything. You never know when you might want something again, what good memories might be evoked by wandering through the detritus of one’s past. And apparently the whole experience is somehow enhanced if you have to dig armpit-deep through an old cardboard box to get at the stuff. About once a year, Basil starts to go through this stuff, gleefully announces a find or two, then after an hour or so gets overwhelmed and packs it all back in the box, moves the box to some other corner of the garage, opens a beer and announces it’s Miller Time. True story. I could set my watch by the whole scenario. I’m all for hanging on to some pieces of the past — it’s nice to refer to old times. If it were me, though, I’d have a wholesale hourlong dumping of stuff, hang on to a few important things, and be done with it. Basil, however, must caress every piece of paper, pore over every old invitation and photograph. Call me crazy, but I prefer my memorabilia nicely organized, labeled and easy to get my hands on. However, unlike the ugly mesh shirt I sidelined early in our marriage, I can’t bring myself to tackle his memories. And so something tells me this particular batch of the past will forever remain in its cardboard nests. « No beginning, no end. So how do I tell the story?